The aim is make a brighter, more attractive space while retaining the look (and practical properties) of cedar and stone. The dark (and slippery) slate will be replaced with lighter tiles with a high non-slip rating. The spa will be re-tiled in light blue tiles. New cedar panelling will be installed, with some feature sections with rock effects. The old shower area will become a new toilet stall. The old toilet stall will become an open shower. In order to remove the wall between the spa and shower/toilet area, an engineering solution was needed. 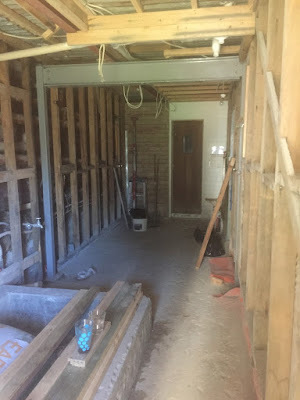 This took a while but a sturdy steel beam has now been installed and the rest of the renovation can continue. The toilet stall still has to be built, but the open shower will make the space more open.